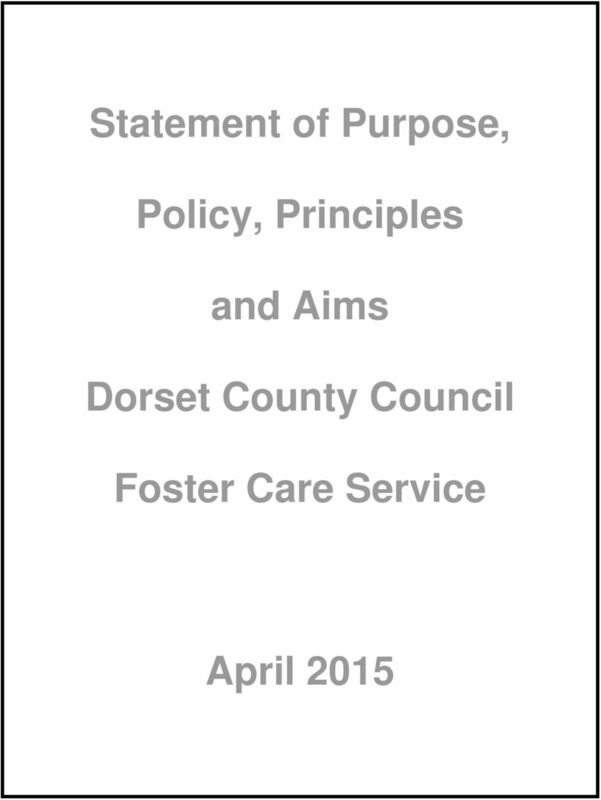 Download "Statement of Purpose, Policy, Principles. and Aims. 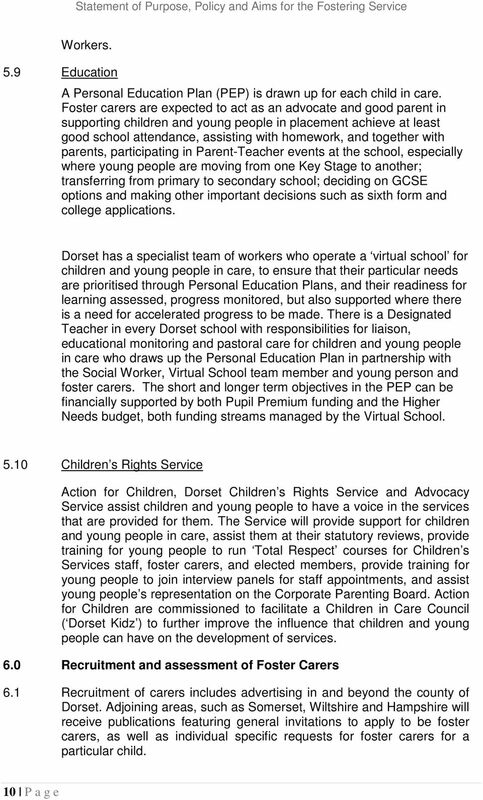 Dorset County Council"
8 7 P a g e receive additional training and have the capacity to provide therapeutic care. 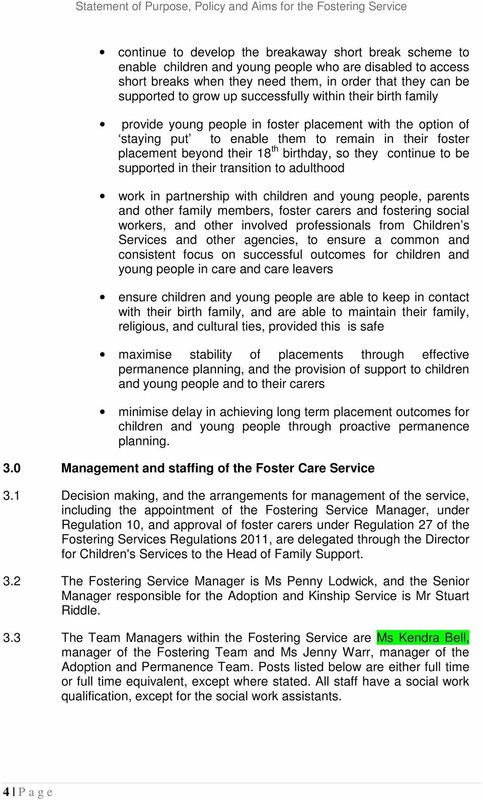 4.6 Parent and Child Fostering Parent and child placements offer the opportunity for parents to continue to be the primary carer for their child in a foster placement. The carer will contribute towards the assessment undertaken by the Horizon service, and/or provide parenting support, as well as providing direct care to the child in the event that the parent is unable to do so. 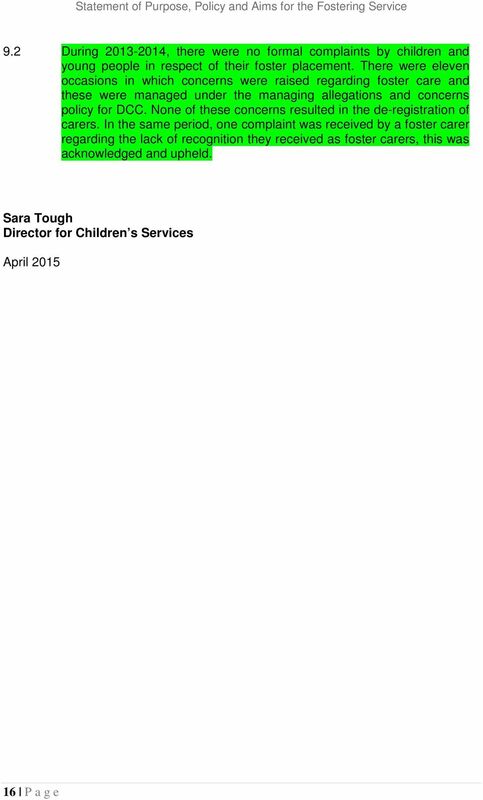 4.7 Full time Foster Placements for Children and Young People who are disabled. 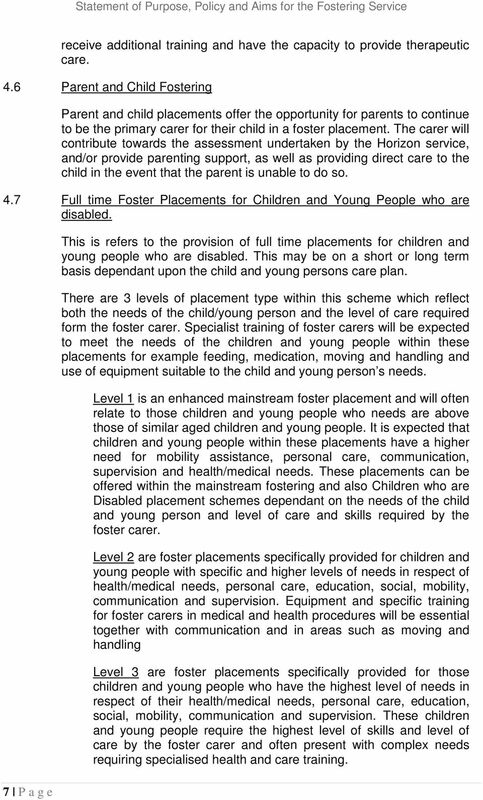 This is refers to the provision of full time placements for children and young people who are disabled. 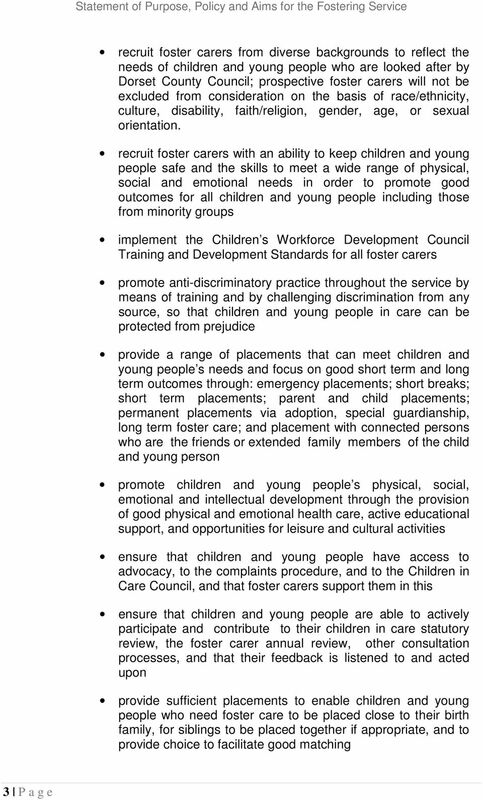 This may be on a short or long term basis dependant upon the child and young persons care plan. 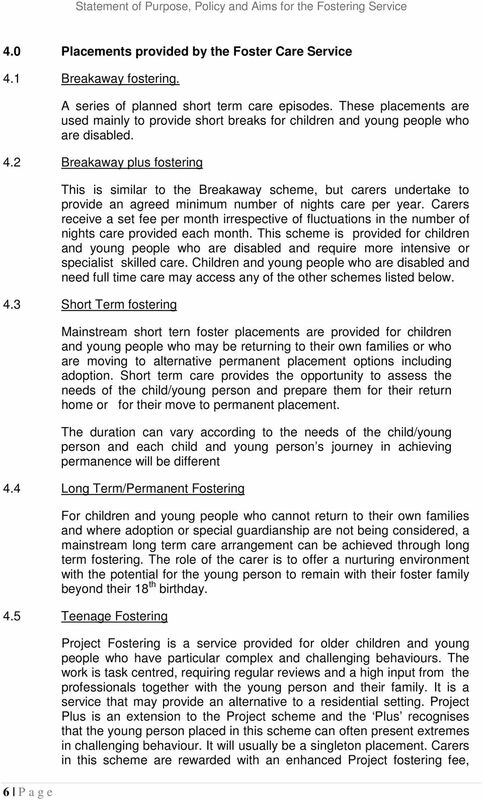 There are 3 levels of placement type within this scheme which reflect both the needs of the child/young person and the level of care required form the foster carer. 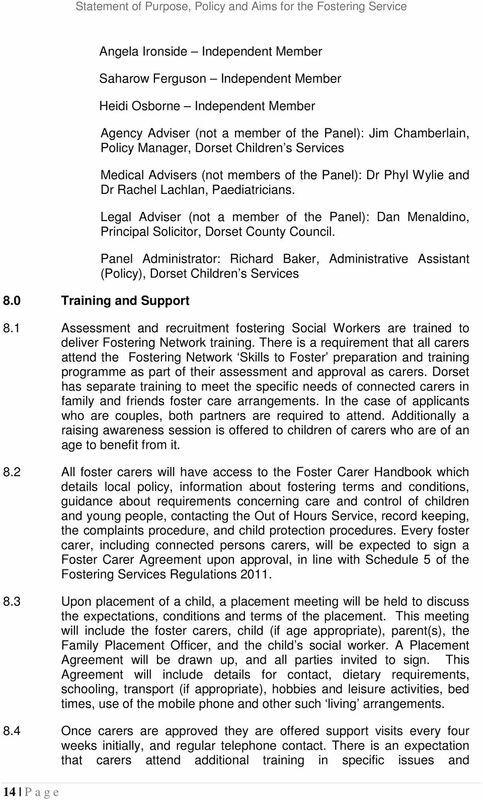 Specialist training of foster carers will be expected to meet the needs of the children and young people within these placements for example feeding, medication, moving and handling and use of equipment suitable to the child and young person s needs. Level 1 is an enhanced mainstream foster placement and will often relate to those children and young people who needs are above those of similar aged children and young people. It is expected that children and young people within these placements have a higher need for mobility assistance, personal care, communication, supervision and health/medical needs. 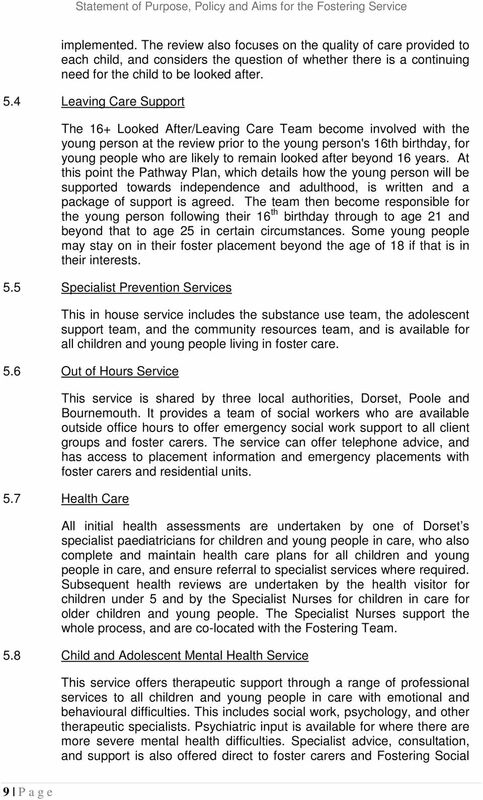 These placements can be offered within the mainstream fostering and also Children who are Disabled placement schemes dependant on the needs of the child and young person and level of care and skills required by the foster carer. Level 2 are foster placements specifically provided for children and young people with specific and higher levels of needs in respect of health/medical needs, personal care, education, social, mobility, communication and supervision. Equipment and specific training for foster carers in medical and health procedures will be essential together with communication and in areas such as moving and handling Level 3 are foster placements specifically provided for those children and young people who have the highest level of needs in respect of their health/medical needs, personal care, education, social, mobility, communication and supervision. These children and young people require the highest level of skills and level of care by the foster carer and often present with complex needs requiring specialised health and care training. 16 15 P a g e developments. 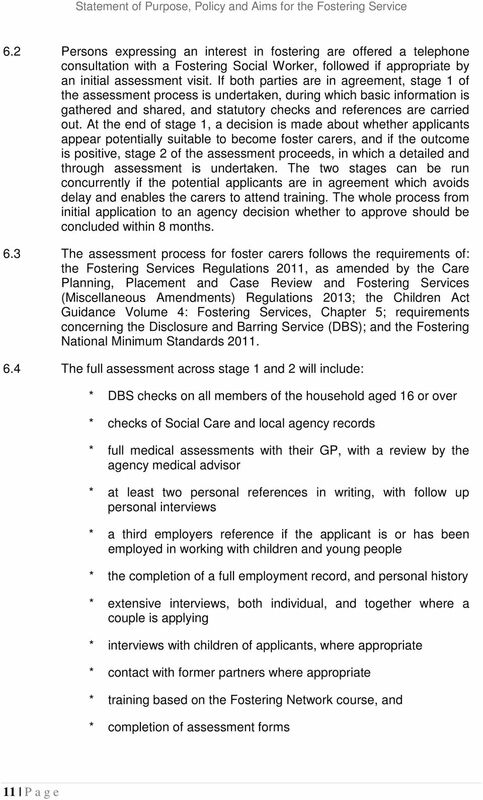 Details of the support visits will be recorded and placed upon the foster carer s file. All foster carers can expect one unannounced visit a year. 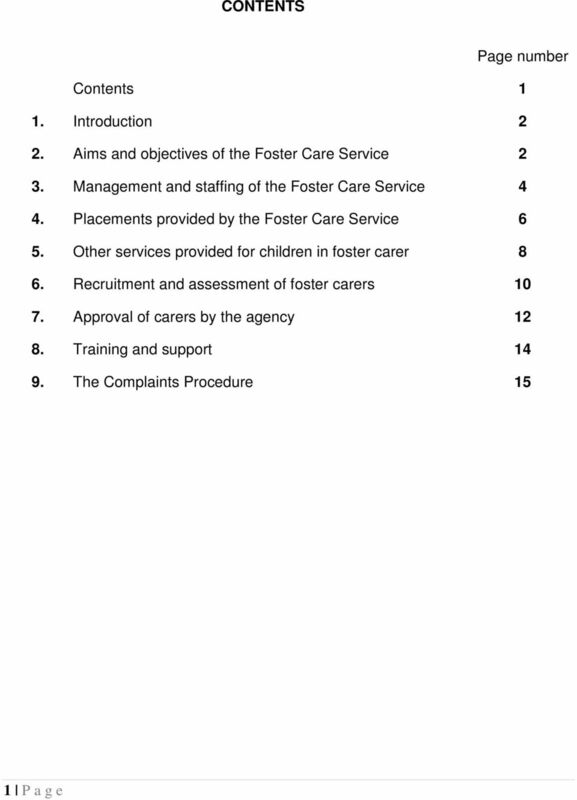 8.5 All foster carers will be offered support to achieve the Workforce Development Council Training and Development Standards within 12 months of their approval. 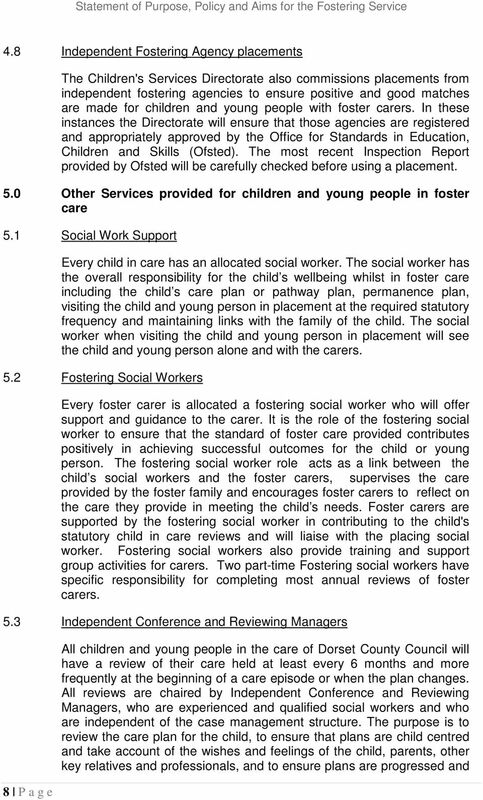 8.6 The fostering social worker support and supervision visits continue whether or not there is a child in placement, and will provide information and advice to enable the carer to develop a consistent and quality approach to the task of caring for the children and young people placed. 8.7 Wider support will also be available to the carers, such as loan of some equipment (i.e. cots, beds, bedding, baby equipment and fireguards), as well as occasional social events with other carers. 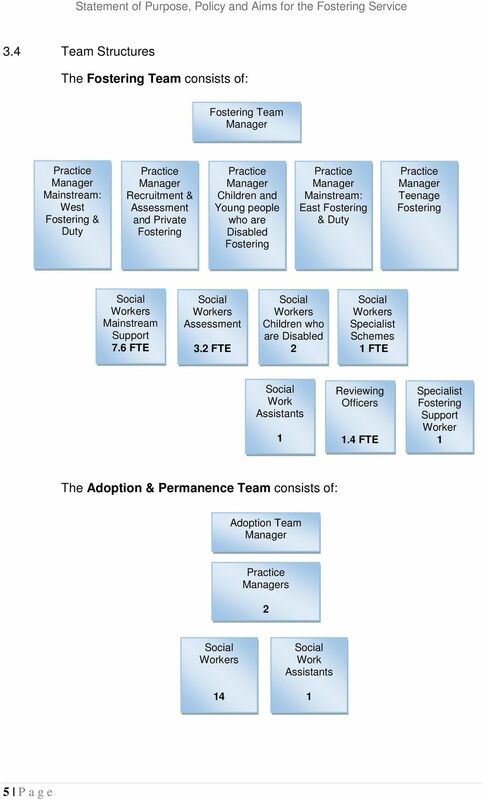 The Directorate can also offer the assistance of sessional workers where there is a particular need for additional direct support to the placement. 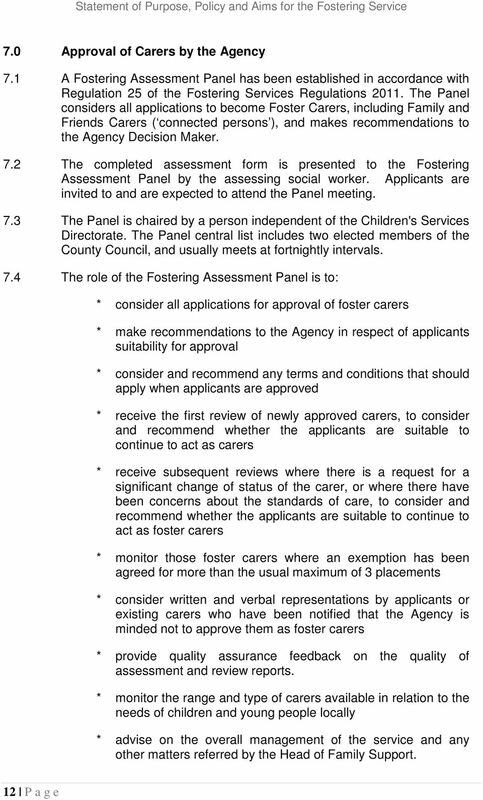 8.8 Every carer will have a Foster Carer annual review. Cares are to which expected to contribute and reflect on their experiences of fostering as a family and the care they have provided.. The review will address matters relating to training, development, conditions of approval, compliments and difficulties will be covered in the review. 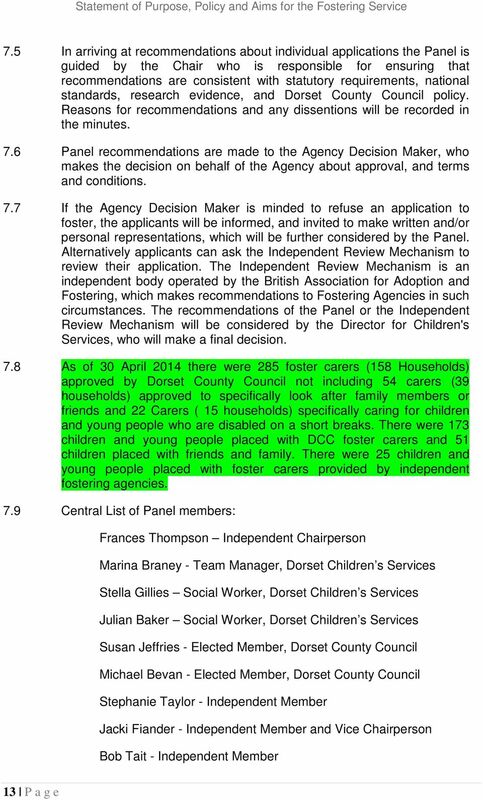 8.9 The County Council funds membership of the Fostering Network for all Dorset County Council carers, including connected person s carers. 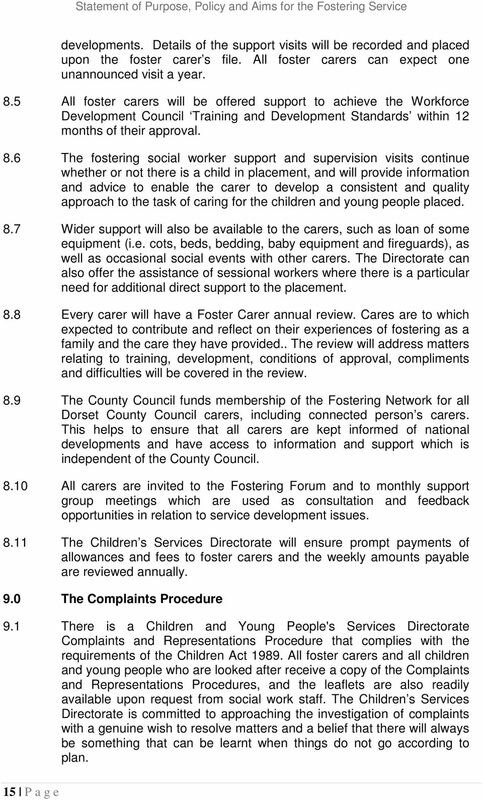 This helps to ensure that all carers are kept informed of national developments and have access to information and support which is independent of the County Council All carers are invited to the Fostering Forum and to monthly support group meetings which are used as consultation and feedback opportunities in relation to service development issues The Children s Services Directorate will ensure prompt payments of allowances and fees to foster carers and the weekly amounts payable are reviewed annually. 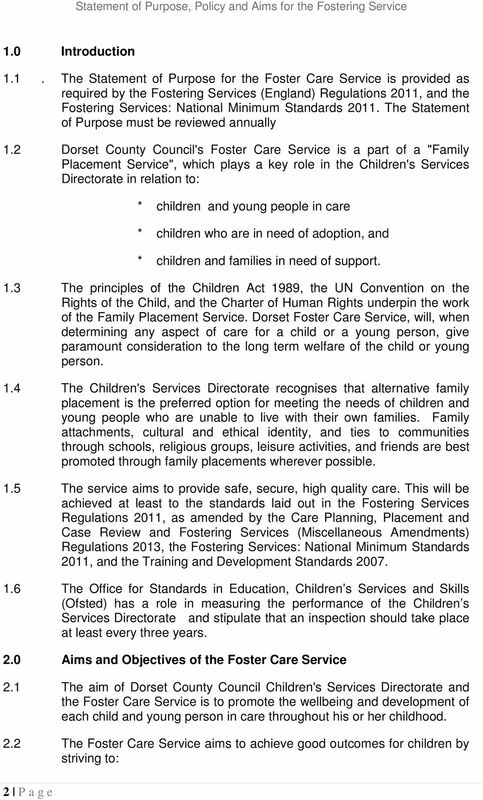 9.0 The Complaints Procedure 9.1 There is a Children and Young People's Services Directorate Complaints and Representations Procedure that complies with the requirements of the Children Act All foster carers and all children and young people who are looked after receive a copy of the Complaints and Representations Procedures, and the leaflets are also readily available upon request from social work staff. The Children s Services Directorate is committed to approaching the investigation of complaints with a genuine wish to resolve matters and a belief that there will always be something that can be learnt when things do not go according to plan.